Automatic doors are contributing several important benefits to the University of Glamorgan’s new Student Union building, including driving down energy bills. Compact Swing Operators, from Ingersoll Rand Security Technologies, were installed at the entrances which not only save energy but reduce the cost of maintenance, while providing secure and easy access which complies with the Disability Discrimination Act (DDA). The automatic doors are an important component of the new building on the Treforest campus which incorporates sustainable materials, including low voltage LED lighting and a self-heating, self-cooling system. 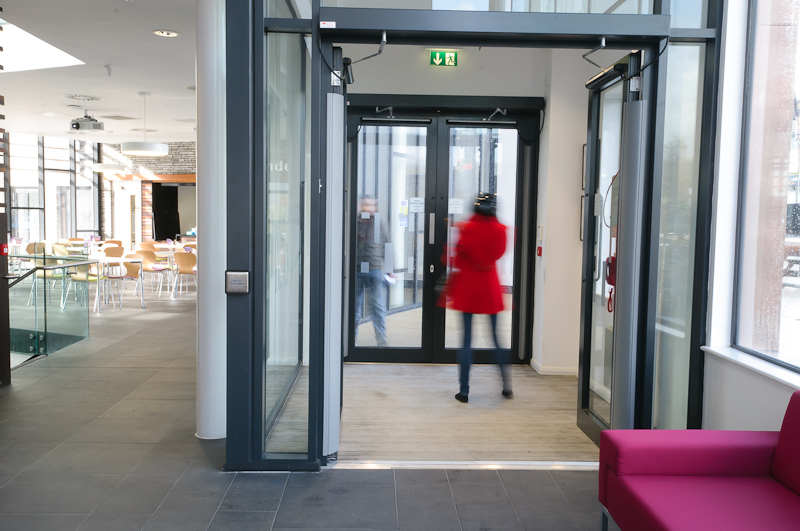 Research has shown that the electricity cost to operate an automatic door system can be as little as £32 per year* but they can make a significant contribution to energy savings, making automatic doors the ideal choice for the university. Using double door lobbies at all the entrances, where there is a constant and heavy flow of people, makes a serious impact on reducing a building’s energy load. Automatic closing of the doors helps to maintain the temperature inside, preventing the escape of heat in winter and cool air in the summer. This has a dramatic effect on reducing the demands on both heating and air-conditioning systems. The Compact Operator is a quick, simple and cost effective solution for converting manual doors to automatic openings in both existing and new buildings. With proven reliability, the Operator offers quiet and smooth operation and is ideal for installation in a wide range of public access projects, particularly in the Education, Health, Retail and Commercial sectors. The Operator is manufactured in high-grade extruded aluminium with a low-profile design. With an overall height of just 115mm and depth of 123mm, it is aesthetically designed to fit most existing profiles and can be adapted on site to suit a variety of door and frame widths. Because the components are mounted on a first-fix backplate, lateral adjustment of the drive mechanisms can achieve perfect alignment of the Operator with the opening. The Operator features numerous control functions including: manual operation, adjustable opening/closing speed, delayed action, and push & go (where the opening cycle is initiated by gently pushing or pulling the door). Two versions are available either using a slide track mounted on the door for fixing on the 'Pull' side or with projecting arms for fixing to the 'Push' side. *Based on research conducted by Ingersoll Rand Security Technologies in a retail environment in 2009.